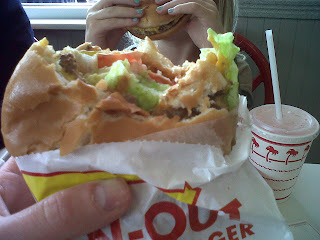 Just in case my last post scared you (with my overly earnest healthy snack options), fear not: we are also madly in love with In-N-Out, and it is our first stop the second we clear the rental car parking lot. The In-N-Out on Sepulveda Blvd. is about a 3 minute drive from the lot, and besides having perfect burgers, it has the best view of the LAX airport. We like to sit outside, and watch the airplanes come in for landing.